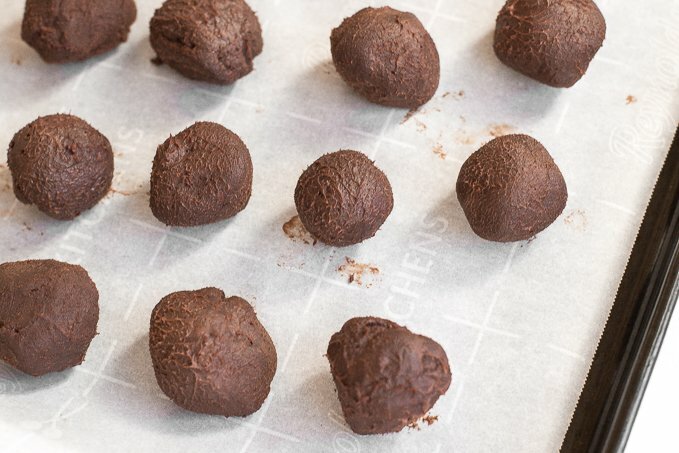 Making homemade truffles is much easier than you might think, so it should seriously be something that everyone should have in their repertoire! 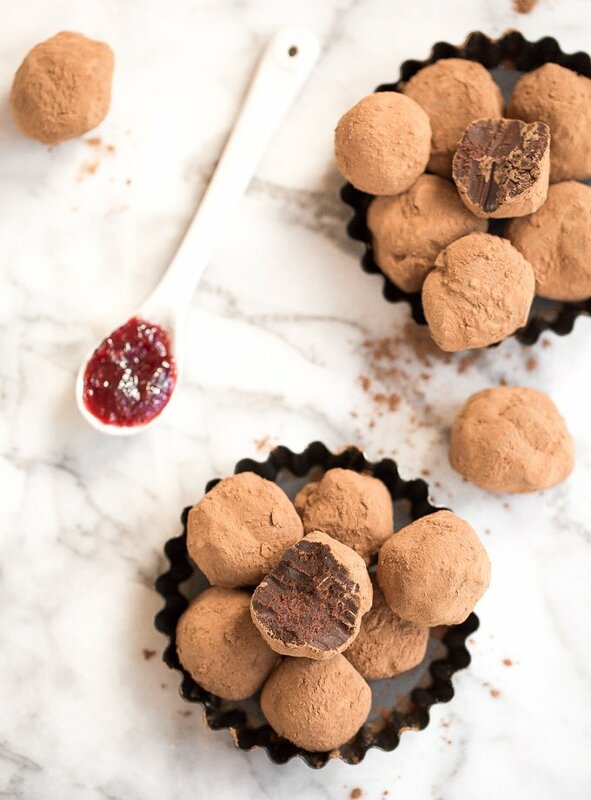 These dark chocolate raspberry truffles are literally as simple as combining high quality chocolate, cocoa and raspberry jam. There is just something about the combination of raspberries and chocolate that go so well together. 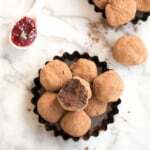 I used a couple tablespoons of a good quality jam that I had on hand, but if you wanted to add a little texture to the truffles, you could easily throw in some chopped fresh raspberries before letting the mixture firm up in the fridge. Just imagine how amazingly fresh that would taste. Or, you could even mix up the flavour completely — add your choice of fruit preserves, a splash of your favourite extract, or chopped nuts. If you get to work on these dark chocolate raspberry truffles now, they could be yours in about 2 hours! Just be wary not to overheat the heavy cream. That is the secret to getting that smooth, creamy texture, otherwise your cream will curdle. Carefully watch the cream while heating on the stove or you risk burning it and having to start over. These are so, so good. 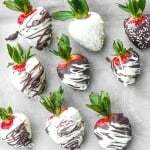 I’m only mad that I didn’t think to make them for Valentine’s Day! I won’t make the same mistake next year. 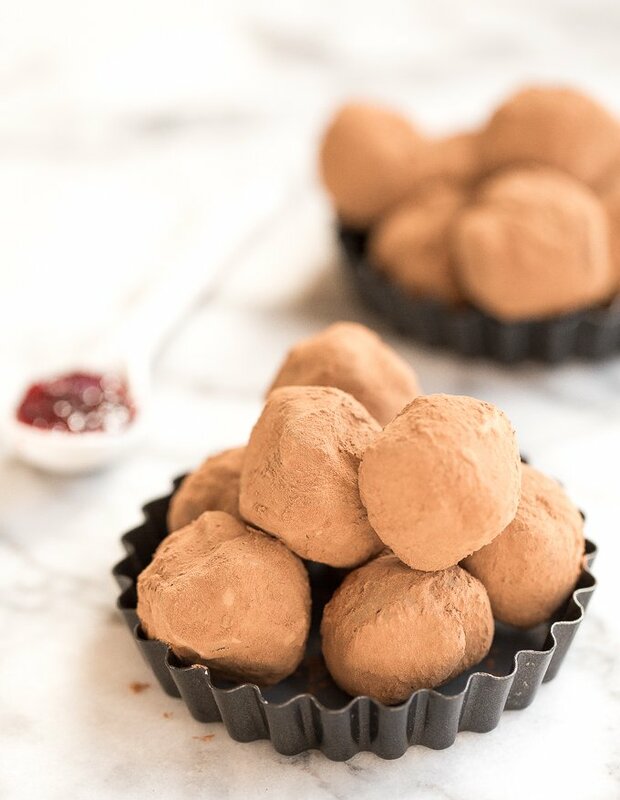 Dark chocolate raspberry truffles is so much easier to make than you might think! It is literally as simple as combining high quality chocolate, cocoa and raspberry jam. 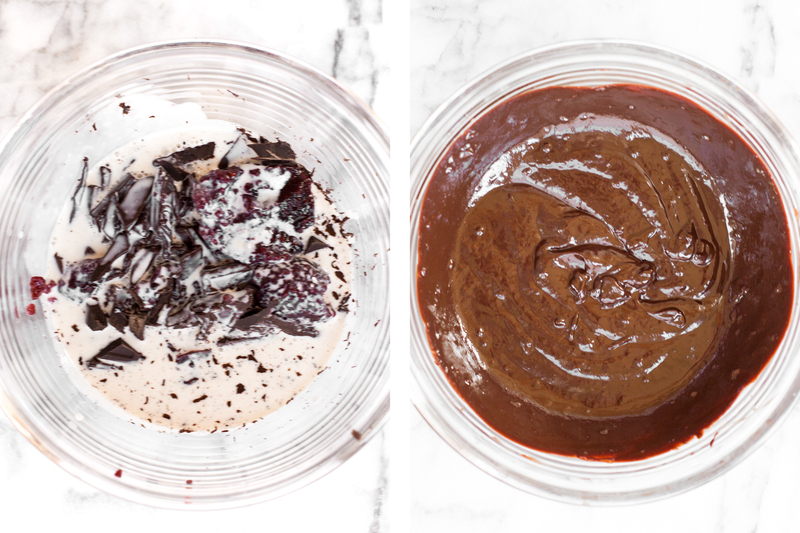 Place chocolate in a medium bowl and set aside. Pour heavy cream into a sauce pan and heat over medium-high heat until almost boiling. Once you see it begin to steam and form small bubbles on the side, pull it off and immediately pour it over the chocolate. Let sit for 5 minutes, then stir together. The mixture should be extremely smooth, with all the chocolate melted. 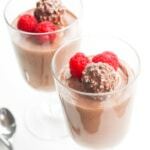 If needed, microwave the cream and chocolate together in 15 second increments, stirring when finished, until completely smooth. Add raspberry preserves and stir to combine. Place uncovered in a refrigerator for about 2 hours, or until ganache has hardened and is scoopable. Line a baking sheet or tray with parchment paper. Using a melon baller or a tablespoon, scoop out small portions of ganache. Use your hands to roll them into small balls. 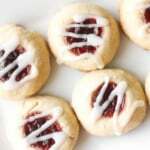 Place on the baking sheet and freeze for 15 minutes. 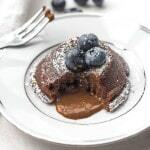 Place cocoa powder in a small bowl. 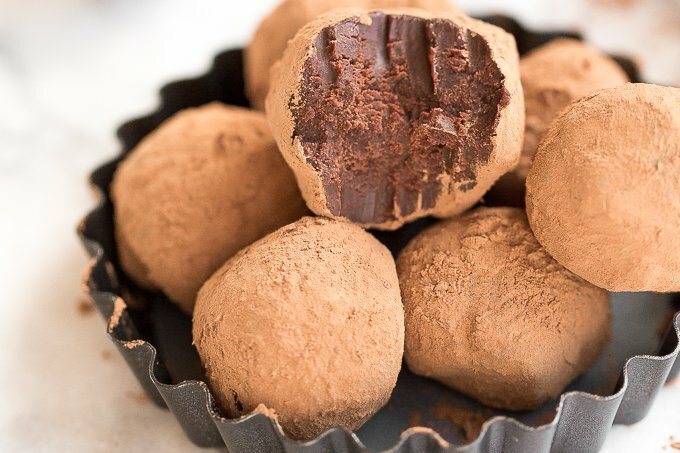 Drop each truffle in the cocoa powder and roll until completely coated. 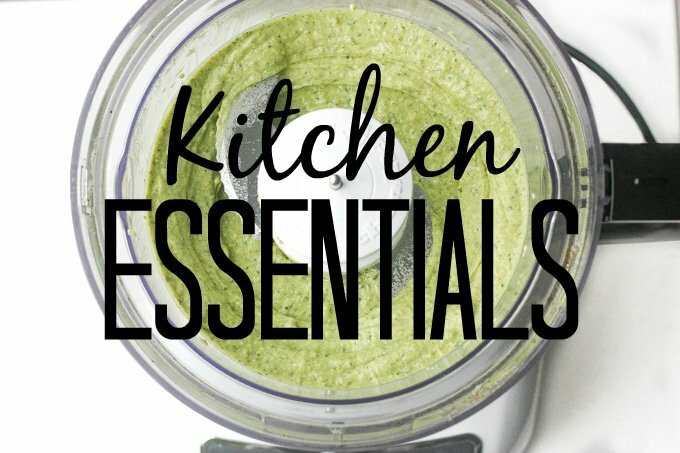 Store in an airtight container in refrigerator until ready to serve. Be careful not to overheat the heavy cream, otherwise your cream will curdle. Carefully watch the cream while heating on the stove or you risk burning it and having to start over. Would this recipe work just using a double boiler to mix the chocolate and cream instead of the listed strategy? It seems like it’d have the same outcome but if anyone’s tried that to disastrous results, let me know. Looks really delicious. I want to try this recipe but I’m not fond of dark chocolate. I might substitute it with milk chocolate. 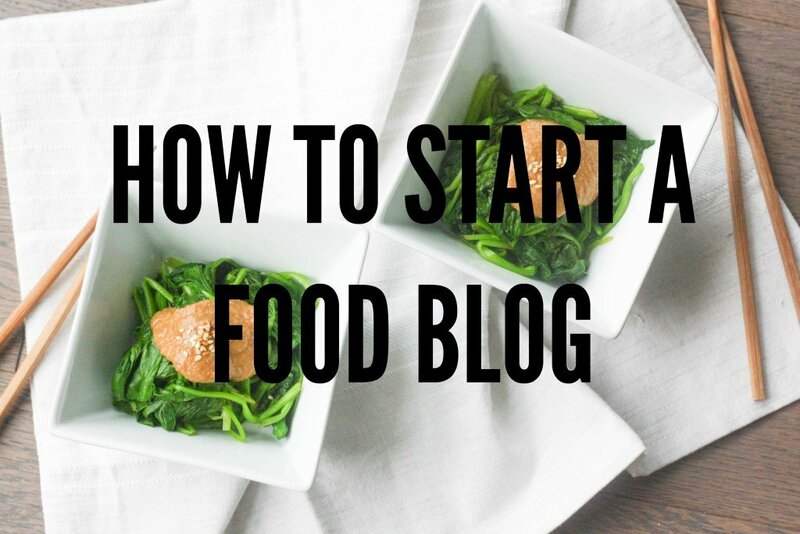 Did you know I have never tried truffles before! Tasted or baked, never. 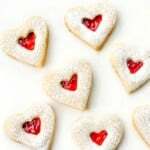 but everyone seems to be loving them so really this post is the opportunity to try a recipe and a new treat!